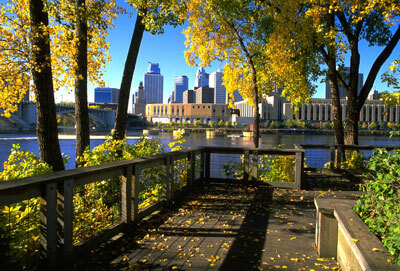 Downtown Minneapolis as seen from Nicollet Island. DeLaSalle High School seeks to build a football stadium adjacent to the school on public parkland on Nicollet Island. 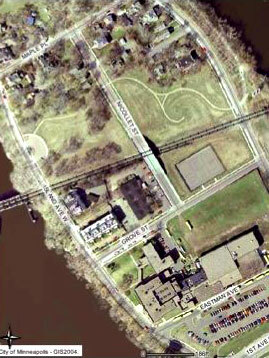 So far, the school has not been willing to explore any option that is not located on Nicollet Island. FMR is advocating that ALL OPTIONS be fully explored before destroying the look, feel and character of this historic and special place. 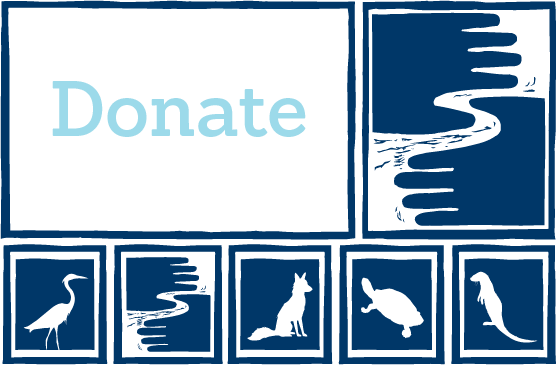 Friends of the Mississippi River has taken a strong position against the proposal because it will impact the scenic and historic character of the island and it removes precious open space from the Mississippi River Corridor in a highly populated area. Although the Minneapolis Park Board agreed by a 6-3 vote last spring to provide land for the project, DeLaSalle cannot go forward without approval from the city to vacate Grove Street and build a football stadium in a historic district with both state and federal designations. On August 8, 2006, the Minneapolis Heritage Preservation Commission (HPC) listened patiently to five hours of testimony and then voted unanimously to deny DeLaSalles application for a Certificate of Appropriateness for an athletic complex on Nicollet Island. DeLaSalle appealed the HPC decision to the City Council for a public hearing and decision. The City Council disagreed with the HPC and overturned their decision by an 8-4 vote on September 22. Voting in support of the HPC decision (i.e. against the stadium) were council members Gordon, Hofstede, Lilligren and Glidden. Council members Ostrow, Johnson, Samuels, Goodman, Schiff, Remington, Benson and Hodges supported the stadium and voted against the HPC. Council member Colvin Roy was absent. There is still another vote or two to come on this issue, so if you would like to contact your council member regarding their vote, please see Take Action below. Aerial view of Nicollet Island. Historic Grove Street would have to be vacated (read: removed) to make way for the proposed stadium. In early 2007, DeLaSalle submitted an application to amend its Certificate of Appropriateness (COA). The amendments address some of the concerns that were raised during the HPC hearing testimony, such as reducing the height of the retaining wall on East Island Ave. and widening the pedestrian trail. But it fails to address the primary problem with the proposal  Nicollet Island is not the right location for a football stadium. The HPCs denial of the COA last fall was not based on design, but rather because reasonable alternatives have not been explored. DeLaSalle still has to gain approvals from the Planning Commission and City Council for the site plan and the vacation of Grove Street. The street vacation requires a two-thirds majority of the council. Friends of the Riverfront, a group of Minneapolis citizens that works to conserve, protect and enhance the resources of the Central Mississippi Riverfront Regional Park, filed a lawsuit in October to prevent the stadium from being built. The lawsuit asserts that the proposed stadium destroys a historic place in violation of the Minnesota Environmental Rights Act (MERA). The suit asks the court to prohibit construction of the stadium as proposed and require the City of Minneapolis and DeLaSalle to comply with state law mandating full exploration of all alternatives. The case involves two distinct tracks. The first is an appeal of the Minneapolis City Councils September 22 decision to grant a certificate of appropriateness for demolition and new construction in the St. Anthony Falls Historic District. The appeal goes directly to the Minnesota Court of Appeals, and it will likely take 9-12 months for the process to unfold. The hearing for this case will probably occur next spring or early summer; the judgment will follow within 90 days. Either side could appeal that decision to the state supreme court. Track two asserted that the proposed stadium destroys a historic place in violation of the Minnesota Environmental Rights Act (MERA). This was filed in Hennepin County District Court. DeLaSalle High School, the Minneapolis Park and Recreation Board and the City of Minneapolis were all named in the MERA claim. In March 2007, however, the MERA complaint was dismissed in Hennepin County Court because in the Judges opinion, the COA appeal is the proper place to address the plaintiffs claims. The FOR team (plaintiff) had filed for summary judgment, which means there is enough evidence to judge the complaint worthy without entering any other testimony or information. DeLaSalle and company had filed a motion to dismiss the case. Read the press release (48 KB PDF) from Friends of the Riverfront responding to MERA complaint ruling and calling on the Court of Appeals to make the City seek stadium options. 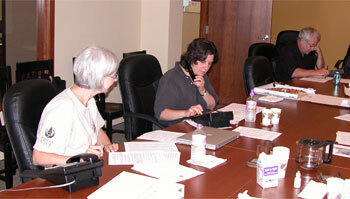 Volunteers work the phones to make sure our voice is heard in upcoming decisions. FMR is currently working in a coalition with the Preservation Alliance of Minnesota and Sierra Club Northstar Chapter to activate our members on this issue. FMR and others have been advocating for the consideration of alternative sites, but DeLaSalle wont budge until the city turns them down. Thats where we need you. Please contact your Minneapolis City Council member and Mayor Rybak and ask them to deny any measures sought by DeLaSalle related to the stadium until the demonstrate that they have fully explored other options. Below you can download a sample letter and talking points. If you would like more information or wish to get involved, please contact Irene Jones at 651-222-2193 x11 or through our contact page.